The woman who brought WOMEN into the FUNK scene! 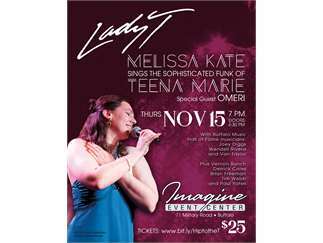 This tribute to the powerful Lady T features world traveled musicians and international singers, homegrown here in Buffalo. Tickets are $25 and seating is limited. Come dance, drink, and reminisce with your favorite Teena Marie songs! with Vernon Bunch, Brian Freeman, Tim Webb, Paul Yates, and vocalists Cynthia Moore and Kelly W.